What do Pilar, Danao, Loboc and Catigbian, Bohol zipline tours in the Philippines have in common? Ziplines. The latest craze in extreme adventure tourism that gives the adventurer the pleasant feeling of freedom, finally swings its momentum and the building speed appears to draw more town-takers of this thrill ride. Ziplines come in a many different names. Pilar calls theirs the Sky Ride, Danao calls theirs the Suislide, for Loboc its the Zipline while Catigbian calls their ride The Mountain Slide. Of these four towns, both Pilar and Danao share in the golden age of Bohol during the heights of the Francisco Dagohoy uprising in 1744 to 1829. Francisco Dagohoy earned his nickname from his rare fighting skills lent by an amulet that allowed him to waft like the breeze (Dagon sa Hoyohoy) and jump off the cliffs, walk the valleys and forge the Isumod ang Wahig or Pamacsalan Rivers in wild abandon and still live to tell the day he escaped the pursuing Spanish soldiers. While the cliffs of Magtangtang in Danao provide Dagohoy’s lairs, and its network of caves which provide the perfect hide-aways to fight it out, the plains of Pilar, was a source of provision for the insurgents in their sorties against Spanish fortifications. 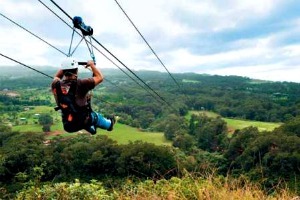 So when Danao’s main eco tourism activity approximates the extreme adventure exploits of the Boholano warrior during the Spanish era, it would be no wonder why Pilarnons, descendants of the warriors, build their zipline to relive the same experience. The Pilar Sky Ride starts off tower rising 76 feet above the large impounding. Ride assistants strap the adventurer with the harness to secure him to the roller which would also freely swing him on his zip down the other end of the time about 150 meters away. Riding the line is safe, even perhaps, without the harness. The height is not as scary and a falling off ends in the water, but Pilarnons know their courtesies. The zip is only a few seconds but the same feeling of stepping off into full trust of the wonders of technology still sends goosebumps to the first timers. The ride ends in the islet, and from there, a motorized banca gets youu back to the parking lot which ends the thrill.